The Beersheba wine festival which is slated to take place on Wednesday has sparked a flurry of angry reactions mainly among Israeli Bedouin leaders who have erected a tent in protest, but also among leaders in the Arab world. 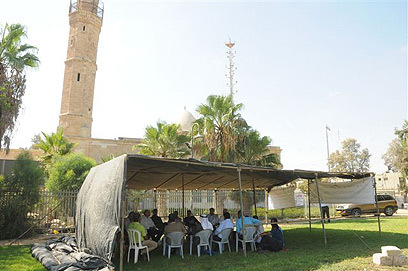 The reason for the unprecedented protest is majorly attributed to the site of the wine festival – the courtyard of Beersheba's largest and oldest Mosque. Many of the Muslims in the city and in the area claim that holding the festival in the courtyard is an insult to them, but the pressure being applied by Arab activists against the festival has reached as far as Turkey, whose relationship with Israel has deteriorated rapidly since the flotilla incident in May 2010. Turkey's Deputy Prime Minister Bekir Bozdağ recently spoke of the matter and condemned Israel's intention of holding a festival where wine would be sold near a mosque. "Israel's plans prove that the country does not respect the religion of Islam," Bozdağ was quoted as saying. "It is an infringement upon Muslims' religious rights and their freedom. Furthermore, it is a complete violation of international law that calls to respect the freedom of religion," he said. Bozdağ further urged Israel to move the festival to a different location. Meanwhile, head of the office for religious affairs in Turkey, Mohammed Gourmiz, demanded that Israel not allow companies that manufacture alcohol to organize the wine festival in a location that is considered a historical site which was built during the Ottoman period. According to Turkey's Anatolia news agency, social media networks in the country have also joined the protest against the upcoming festival, as bloggers have opened up an account on Twitter called: "Say no to wine festival in mosque." One blogger further wrote: "Respecting the mosques is part of respecting Muslims." Arab leaders outside of Turkey have also begun condemning the event. The Arab League recently published an announcement in which it warned Israel of holding the festival near a mosque. The announcement further said that holding such an event in the location chosen is a provocation and is disrespectful to the religious feelings of Muslim across the globe. Ekmeleddin İhsanoğlu, Secretary-General for the Organization of Islamic Cooperation backed up the announcement made by the Arab League, saying that the sole purpose of holding the festival at the chosen location is to wipeout the Palestinian identity and to defile its holy sites. The Beersheba Municipality said in response: "The festival would not take place inside the museum, but in the courtyard between it and the Negev Museum. This festival has become a tradition that the municipality sponsors through Kivunim, and it is slated to take place for the sixth consecutive year. During the past few years, the event took place with exemplary quiet and without any disturbance or complaints. It's unclear why the complaints are being made now." See all talkbacks "Arabs protest wine festival near mosque "